Never be in doubt about the future with this book, originally published in 1863. The contents include the "Lady's Love Oracle" for answering all of your questions about affairs of the heart. All you need are three dice, which are available in pewter or wood, and this book. Perhaps to show its importance, that section takes up more than half the book. 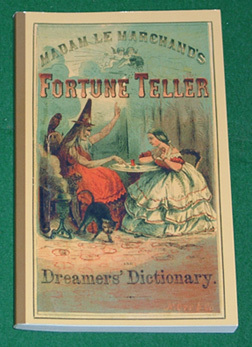 Following that activity, you are instructed how to tell fortunes with cards, interpret dreams, and read palms. And if that isn't enough, there are instructions for telling a person's character by assigning numerical values to the letters in that person's name (according to a chart in the book) and then adding the numbers. And if you want still more methods, there is brief mention of many other ways of telling the including using tea leaves, coffee grounds, or the moles on a person's body. But my all time favorite is "How to Tell with a Pack of Cards, Which of Three Ladies has the Best Husband." I won't tell here how it is done but I most heartily agree with Madam LeMarchand.